Technology has disrupted almost all aspects of life and has managed to penetrate into even the most traditional Indian events. Kumbh Mela 2019, probably the most sacred and holy event that is held to commemorate the river Ganges, is all set to begin. As per the ruling party BJP, this Kumbh will be the most ‘technologically advanced’ so far and is an event that nearly 12 crore devotees are expected to attend. Thanks to technology, devotees who cannot attend the event can watch Kumbh Mela 2019 live online. This festive event that will begin on 15 January and go on till 4th of March holds enormous significance amongst Hindus, and is something telecom companies realize. Therefore, Airtel, Vodafone and Reliance Jio have announced several special initiatives to carter to the devotees. Reliance Jio has announced the Kumbh JioPhone, which will offers a suite of benefits especially designed for the needs of the Kumbh Mela pilgrims. Some of the features that will be hosted by the phone will be real time travel information, booking of tickets, emergency helpline members, schedules of the Kumbh Mela, family locator, telecast of special events of the mela on JioTV along with previous archives of Kumbh, Kumbh radio, and news alerts of the event to name a few. In addition, Airtel in partnership with VR DEVOTEE , is putting up special kiosks at the venue (in Prayagraj) to offer Virtual Reality based immersive experience to visitors, who will be able to enjoy real life like display of proceedings right from the kiosks. The company Kalpnik Technologies, creators of VR DEVOTEE is based out of Bangalore. And as far as Vodafone is concerned, devotees can collect and wear the Vodafone RFID tag, using which devotees’ movements and location can be tracked. Airtel Digital TV app users and Jio Tv consumers can watch the Kumbh Mela 2019 live online. Apart from this, the event will be broadcast live by All India Radio (AIR) and Doordarshan channels. AIR has set up a separate one kilowatt FM transmitter called Kumbhvani. 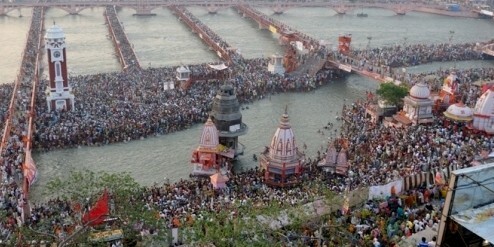 The broadcast from Kumbhvani can be heard between 5:55 AM and 10:05 PM everyday in a radius of 35 kilometers. Devotees can also listen to the live proceedings of the Kumbh Mela on YouTube. “Live broadcast and telecast of all three Shahi Snan (Bathing) of Akharas on Makar Sankranti 15th January, Mauni Amasya 4th February and Basant Panchami10th February will be made by both Doordarshan and AIR on national hookup. Live coverage of remaining bathing festivals of Paush Purnima, Maghi Purnima and Maha Shivratri will be telecast by DDUP and it will also be available on DD India channel. Doordarshan will start its telecast of special programs on Kumbh Mela from January 15 and about three hours programs based on the activities in the Mela area will be made every day. DD and AIR set up about one dozen booths for live coverage and commentary of Shahi Snan. DD has installed multi camera set up at about half a dozen places across the Mela. Doordarshan has deployed about 150 personnel from Program, Engineering and News wings for the purpose. Both AIR and DD have set up their camps in the Mela area,” says a blog post by Ministry of Information and Broadcasting. Yogi Adityanath, Uttar Pradesh CM, recently inaugurated 15 digitalised and interconnected khoya paya centres at Kumbh that have been established in mela area and Prayagraj to trace missing persons. A dedicated Rail Kumbh Seva mobile app is now in place. 4000 hotspots to enable devotees with high-speed internet have been setup. 50 Reverse Osmosis water ATMs to provide devotees with clean drinking water have been established. 1,400 CCTV cameras have been installed to monitor the crowd. 22 lakh eco-friendly toilets have also been installed. Watch Kumbh Mela 2019 Live Online: The Most Technologically-Advanced Kumbh So Far 0 out of 5 based on 0 ratings. 0 user reviews.